Today’s post is from Veronica Bray, a planetary scientist at the Lunar and Planetary Laboratory in Tucson. 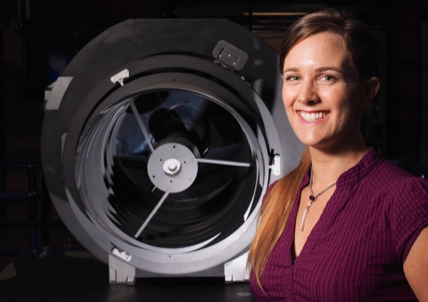 She specializes in comparing the surfaces of planetary bodies across the solar system. I love looking at New Horizons’ images of Pluto! But I spend most of my time looking elsewhere. Why? Because comparing Pluto with other planetary bodies helps me to understand what processes could be operating on Pluto’s surface and beneath its icy crust. Although a full understanding of planetary processes is a more complicated matter, the initial steps that I take as a comparative planetologist are simple: compare what the features look like on the different bodies. Pluto’s surface is comprised of water ice and other exotic types of ice (e.g. methane, carbon monoxide, nitrogen). This makes comparison to the icy moons of the outer solar system a logical place for me to look for analogous landforms. However, as the close-up images of Pluto came back from New Horizons, I was reminded of places closer to home. This blog post presents two examples of features on Pluto that remind me of landforms on Earth and Mars. Polygons: Polygons on a planetary surface typically have five or more sides and can form in several different ways. When the New Horizons team first saw the polygons of the icy plain on Pluto that we informally call Sputnik Planum (Figure 1B), a number of questions arose: Were these patterns due to the heating up and cooling of the surface, leading to expansion and contraction cracking like the polygons seen on Mars (Figure 1A)? 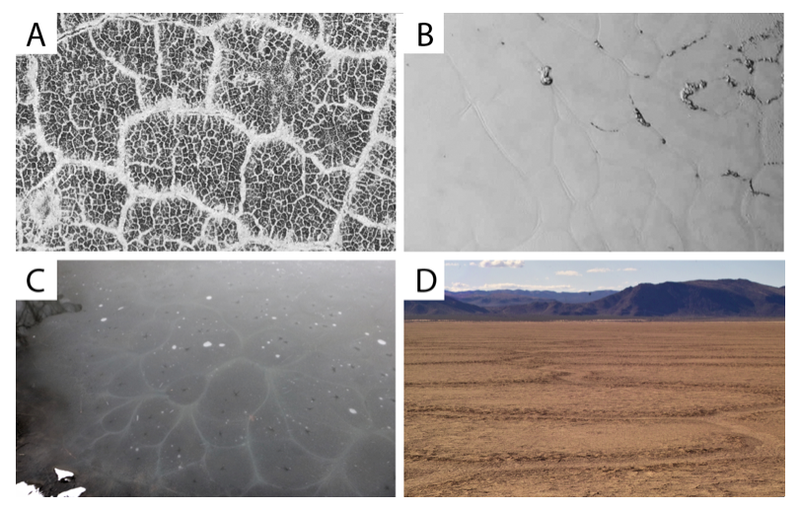 Was sub-surface convection of warmer ices creating a cracked surface above the convection ‘cells’ as can be seen in the surface ice of frozen lakes on Earth (Figure 1C)? Or were they similar to ‘dessication’ mud cracks (Figure 1D) formed by the drying out of the surface material? We each had our own theory and the team buzzed with discussion about what might be going on. We showed one another pictures taken by spacecraft in other places it the solar system; we even shared photos that we ourselves had taken from business trips and fieldwork! All so that we could take the next step in understanding these features: to compare the morphology. The polygons on Pluto’s Sputnik Planum have edges that are smoother and more curved than the linear sides of the mud cracks or Martian freeze-thaw polygons. Instead, the polygons of Sputnik Planum most closely resemble those formed by sub-surface convection (although on a MUCH larger scale than the example used in Figure 1C.) Our current understanding of the polygons of Sputnik Planum is that they mark the top of convection cells within a slowly churning mass of nitrogen and carbon monoxide ices. So, although I was initially reminded of processes on the Earth and Mars, this process on Pluto is far more exotic and has never been seen anywhere else in the solar system! I can usually count on impact craters to be present to assist me with comparing planetary surfaces. All but a few surfaces in the solar system are scarred by hypervelocity impacts that penetrate down into the crust. I compare the shapes of impact craters on Pluto and other bodies to investigate the crustal and sub-surface properties. Figure 2 shows examples of ‘central pit’ craters – large complex craters with a pit at or near their center. 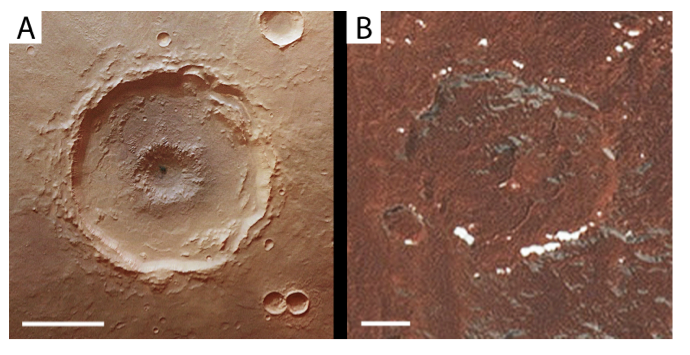 The diameter of the pit compared to the diameter of the crater for the Pluto example (Figure 2B) is similar to the Martian example (Figure 2A), which might suggest a similar formation mechanism. Although various types of pits or pitted-peaks can be found in craters across the solar system, this type of central pit crater has a particularly large pit relative to the crater size and is only found on ice-rich bodies. Their formation has consequently been linked to the presence of water ice in the crust. It is not surprising then that we found this central pit on Pluto in the informally-named Cthulu Regio, in an area of noted water-ice content. But of course, the story is never that simple. The presence of sub-surface layering has also been suggested as a reason for the formation of central pits. I am currently measuring and comparing the central pit craters across the solar system to determine why and how central pits form, and consequently, whether their presence on a planetary surface can be used as a prospecting tool for water ice or target layering. The new observation of a central pit crater on Pluto from New Horizons provides another important data point to add to my quest to understand how these craters form. Next Next post: Rotational Movies of Pluto and Charon: It’s Show Time!